« Share your favourite Urban Yarns story! Did you make it to Knit City over the weekend? If you missed it or haven’t heard about it yet, it is time to get in the loop because you definitely don’t want to miss out again! 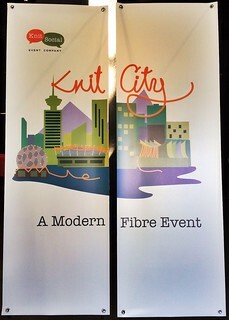 Knit City was created by young mom’s, Fiona and Amanda who met in a local knit group and desired to unite all knitters and fibre enthusiasts in our local community. Their mandate is “to help this community of crafters and artisans grow and become even more closely tight-knit”. 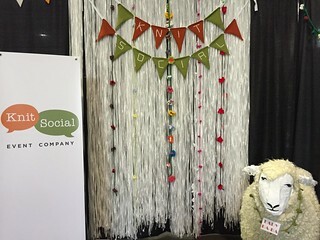 This they definitely have accomplished and even so much so that they had to change venues this year to accommodate its growing success at becoming Vancouver’s best knitting event! As a result it was held at the PNE Forum instead of the Croatian Cultural Centre. The change in venue allowed for more vendors, a larger class selection and more space to just hang out and knit. In classic Knit City style there was a long line up of eager knitters waiting at the door well before the 10am open on Saturday and the traditional hand dyed colour way yarn, special for the event was sold out by the end of the day!! We look forward to this event every year, to be part of such a fun knitting extravaganza in our own community. 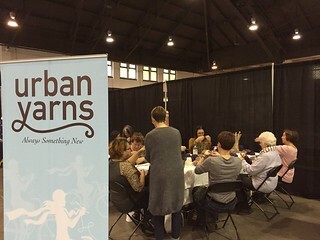 This year Urban Yarns staff were very busy teaching arm knitting to all ages, it was packed with enthusiastic people getting all tangled up in yarn. What did you think of the new venue? Were you one of the lucky ones that got into the sold out Steph Pearl Mcphee’s Knitting For Speed and Efficiency class or did you hang out with Kate Atherley, Holli Yeoh, Amy Singer, just to name a few. Did you get a skein of the 2014 colour way yarn? What are you going to make with it? and what were your highlights and fine finds from the market place? We would love to hear all about it, what you couldn’t resist and what you have now casted on those needles. 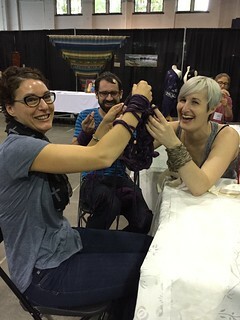 Let’s see those arm knitting pictures!! This entry was posted on Wednesday, October 8th, 2014 at 7:30 am	and is filed under Uncategorized. You can follow any responses to this entry through the RSS 2.0 feed. Both comments and pings are currently closed.